The Christmas holidays are a time of getting together, drinking like goats in the desert and playing board games. For all of you who enjoy complex strategy games whose instructions are longer than the Twilight saga and require an abnormal attention to detail being sober: stop wasting time on my blog and go read yourself some Encyclopædia Britannica. For all the ones who like silly games taking out the worst in them: I have something for you. One morning of November I was sick and in a fever delirium. 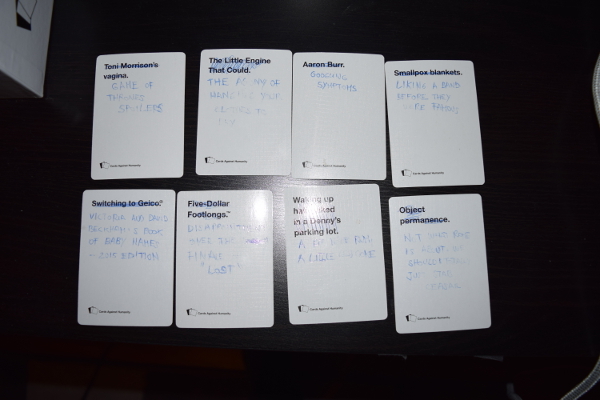 It seemed the perfect time to take all the white cards of Cards Against Humanity which made no sense to me (Yes, all FOURTY of them!) and change them into something that made me laugh. I don’t know who Toni Morrison is, but I’ve seen people balling and threatening to take their lives after reading on the internet the identities of the latest dead characters in the HBO show. After doing this in 2012, 2013 ad 2014, not only I managed to keep the tradition alive, but I’ve also published my list before Pitchfork did. Hooray! These are my favourite records from 2015. Years ago Sufjan Stevens released a record called The Age of Adz that featured acoustic gems alongside electronic-driven songs and a 25 minute epic closing track. I thought it was the coolest thing ever. When I read that the new record was going to be more of the old Sufjan (keywords: ballad, stripped down, banjo, quiet) I was ready to be bored – if not disappointed – by what turned out to be a little masterpiece. 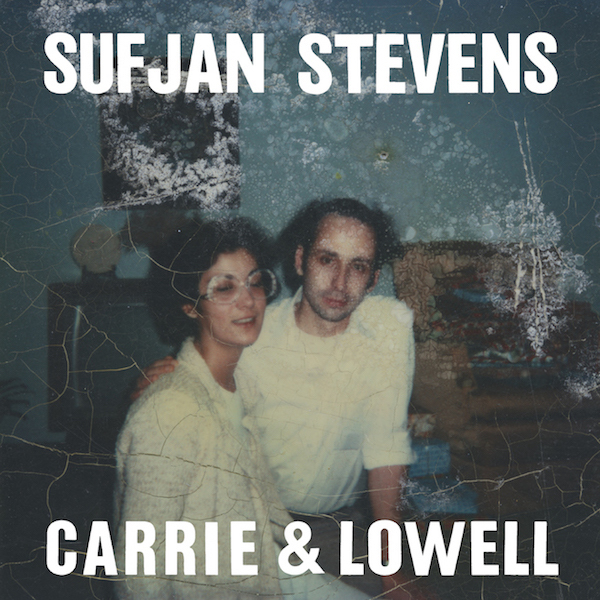 Carrie & Lowell narrates the death of Sufjan’s mother (and its aftermath) in microscopic, heartbreaking detail. It is full of conflicting emotions, disconnected images and the pseudo lucidity of a person who’s most likely still in the eye of the storm. Its intimate closeups on family memories intersect with the record’s more abstract poetic to create something that’s not only accessible to the listener but also incredibly, frightfully relatable.